Almost 7,000 people entered Red Bull's third annual Illume sports photography contest this year, making it one of the largest photography competitions ever staged. And finally, at a ceremony in Hong Kong yesterday, the jury announced its winners. Who knew snowboarding could be so moody and artful? The winner of the whole shebang was Lorenz Holder, a German photographer who works at a snowboarding magazine. 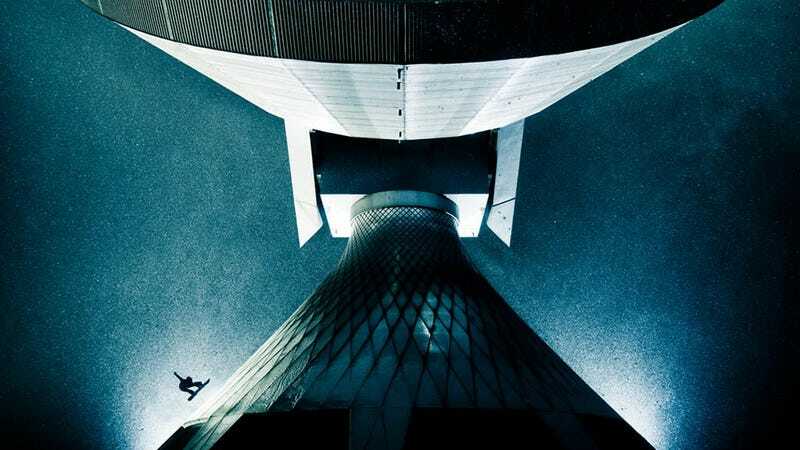 His winning snap showed Xaver Hoffmann, a professional snowboarder, midair against a gigantic satellite dish near the border of Germany and Austria. "I found this unique spot in the summer and I really wanted to shoot a snowboard picture there," Holder explains. "I used two big Elinchrom strobes in the background to light up the snowflakes and create a ‘white wall’ where I could capture Xaver’s silhouette as he jumped." The jury had to sift through a mind-boggling 28,000 entries to this year's contest. We checked out some of the most inspiring entries a few weeks before the winners were announced, but now, the experts have weighed in: here are the best sports and action snaps of the year. Overall Winner: Lorenz Holder, Germany. "New Creativity" Category Winner: Daniel Vojtěch, Czech Republic. "This shoot took place in a studio because we could control all the lights very easily and wanted to create a backstage feeling, and also because it was very easy to suspend the bike from the ceiling," says Vojtěch. We had one special rope for Tomas and two smaller ones for the bike." "Illumination" Category Winner: Scott Serfas, Canada. "We had been in Alaska for a month and I knew the trip was ending very soon," Serfas says. "The sun was setting fast so the director Curt Morgan called for Travis to drop into the line and as he made his second turn down the mountain I snapped this shot. This turned out to be the last photo I took during what was the best snowboarding trip of my life!" "Energy" Category Winner: Romina Amato, Switzerland. "I was covering the Red Bull Cliff Diving World Series on the Islet of Vila Franca do Campo in the Portuguese Azores from a boat," Amato writes in a statement. "I saw this angle between the rocks but it was difficult for the boat driver to stay in position... The skipper fought so I could see what was going on and try to anticipate when to hit the right position to get the shot before the diver disappeared behind the rocks. Eventually it all fell into place!" "Late one fall I gathered a group of America's next generation of young surfers, and we departed for Fiji to try our hand at an impressive south swell," Maassen remembers. "They surfed for ten hours a day, coming in only for food or sunscreen. I captured them one morning in this shot, discussing in the crystalline water anything from the surf they were enjoying to homework they forgot at home." "Skating the street from front to back a couple of times, I kept trying to get the right shot," Nieuwhuis explains. "After almost smashing my camera on the concrete, I thought I would give it just one last try. This is the last image I shot in that series." "Experimental" Category Winner: Lorenz Holder, Germany. "As I had used a tripod so many times, I found out that I could flip different pictures in Photoshop and put them together again to create a totally different, new world that doesn't exist in real life," Holder explains. "All the pictures have perfect symmetry and that’s something I like a lot. In this picture, I mirrored parts of the building to get a really, really big building." "Sequence" Category Winner: Zakary Noyle, United States. "This was not a large day by North Shore standards but sort of a lay day. When the waves are smaller, the surfers usually go out for a surf right before the sun sets," says Noyle. "By pulling the lens back, I was able to get the sand and sky, so it is almost as if someone were walking down the beach and looking over to see Gabriel doing this massive backflip." "Spirit" Category Winner: Chris Burkard, United States. "We woke at dawn to what appeared to be clear skies and we immediately scrambled to get our things together. Windows of clear blue skies are rare in these parts of Norway and each minute that passed as we gathered our boards and wetsuits seemed twice as long," says Burkard. "The snow had piled high around us and soon it was pretty clear that our truck was not going anywhere fast. Dane and Keith knew another surf session was nowhere in sight and decided to head back into town. As the storm continued to brew the pair made their way back home." "Wings" Category Winner: Samo Vidic, Slovenia. "I was booked for the Red Bull Cliff Diving World Series stop in Greece," says Vidic in his statement. "I usually try to get different styles of photos from the water and here I was lucky enough to capture a bird flying next to Jorge Ferzuli."